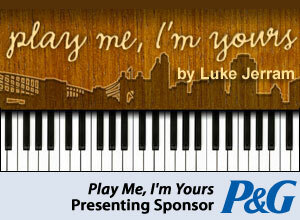 "Play Me I'm Yours" Comes to Cincinnati & Northern Kentucky! Are you a music lover? Are your children interested in music? If so you are going to love the “Play Me I’m Yours” Installation that has come to town! Scattered throughout Cincinnati & Northern Kentucky are beautifully painted pianos. 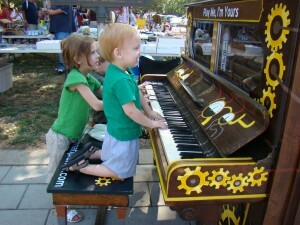 These pianos are strategically located at high traffic areas, like the Zoo, the Museum Center, Main Strasse Village, and more (for the full list visit http://www.wguc.org/events/playme/). These pianos are meant for anyone passing by to play a tune. Hopefully they will bring beauty, start conversations and build friendships while resting on our corners. We saw our first piano across from the Goose Girl Fountain in Main Strasse Village in Covington. There was quite a crowd that day, but most people were just looking at the piano with curiosity. My kids plunked themselves down and began to play (ahem, bang the keys). I hope that more people will get into the groove and start belting out the tunes! Let’s have some sing-alongs on the street corners! The pianos can also be used for “scheduled shows” so if you are a musician looking for a place to play you should contact the organizers of this event! I for one can’t wait to check out all of the awesome paint jobs on the pianos and let my children explore music! We are excited about this project and will be looking all over Cincinnati for more pianos to bang play music on! British Artist Luke Jerram (check out his site – breathtaking pieces) is the mastermind behind this event. Before Cincinnati there were installations all over the world, and in NYC. Local community art centers & teens from “ArtWorks” helped Jerram paint the pianos, and WGUC is sponsoring the event. The pianos were all donated for this project. The pianos will be available for the public to play from August 9 – August 27 (with an encore in 7 different locations through September 17). For more details on this fabulous & fun project visit WGUC’s website, or look for “Play Me I’m Yours” on Facebook. 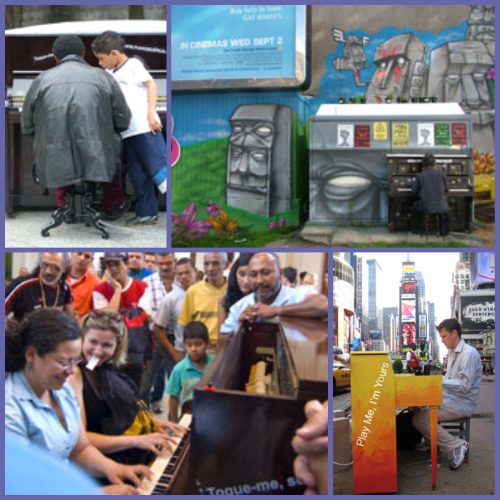 The website for Play Me, I’m Yours has set up a page so you can upload pics and videos taken at each of the pianos throughout the city – what a terrific scavenger hunt idea for the kiddos, right? And a lovely way to become part of this amazing work of art forever! 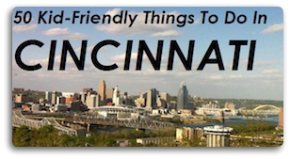 How cool is Cincinnati that we’re second only to NYC for this exhibit here in the States? And FYI NYC: WGUC contracted first, you just got the earlier date, so there! It was late Monday evening when I decided to go to Jungle Jim’s in Fairfield – my neighborhood store. I was tired as I finished my shopping and was speeding past the elephants, giraffe, monkeys and more on my way to my car when I suddenly heard piano music. And there it was, one of those “Play Me I’m Yours” pianos I had read about. The pianist, obviously knew how to play the piano – not my two finger kind of playing – it was lovely and a great treat at the end of a long day. We are checking this out this weekend!